Koan is a Moscow based duo born in early '90s from the efforts of the Roeth & Grey collaboration. The career of Daniel Roeth begun as independent DJ, who played at closed hard techno and acid trance parties. After getting his hands on his first software tracker he temporarily postponed his dj work and concentrates on composing music. He is the main driving force behind Koan. He manages to combine generating musical ideas and recording them as new tracks and key performances at prestigious events worldwide. He also manages to write music for video games and musical collages for Russian documental films (VGIK) in paralel to his other work. For a while William Grey programmed Atari-XE, Commodore-64 and PC based tracker modules, as well as participated in the demo scene. Specialising in the multi-format computer and sampler based music, sound design and a wide scope of musical reviews and criticism William is currently an art director and executive producer of Koan. Roeth & Grey got aquainted and began working together in 1993. They based their work from sampler subculture with trance elements. Three distinct projects were born after they divided the studio space responsibilities: Koan (ethno-chillout / ambient), Vacuum Stalkers (progressive trance) and Fatum Sci-Fi (noise experimental and IDM). During 15 years of diligent work their sound was formed and molded, performance technique was honed, sound and computer hardware was changed. Projects gathered momentum and new listeners. Koan is most well known and successful Roeth & Grey project. It is one of the leaders of Russian chillout-scene, widely known abroad. Participant of many international festivals and prestigious events (Ethno-Life Russia, Transylvania Calling Romania, Underwater Overground Croatia, Fullmoon Germany). Enigmatic figure always in avantgarde of Russian electronic music. Koan has a wealth of experience working with wide known european labels (Iboga Records (Denmark) and Blue Tunes Recordings (Germany). Duo are known for conceptualism, innovation and excellent taste. Every release is an explosive mixture of ethno-electronics and surprising combination of different musical cultures. Duo's trade mark is highest technological level of execution and emaculate sound quality. Koan - Figment (Preview .. 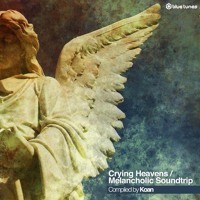 Birds Of Paradise - Oce ..
VA - Crying Heavens - M ..
Koan - The Way Of One ( ..
Koan - "Ariadne's thre ..